Overview: What is a Connective Tissue Disorder? A connective tissue disorder targets the body’s connective tissues, which are the structural materials (mainly the proteins, collagen and elastin) that hold the cells of the body together. With a connective tissue disease, these proteins are injured by inflammation and can affect the skin, joints, bones, heart, blood vessels, lungs, eyes, and ears. Lupus erythematosus is an autoimmune disease, meaning the immune system mistakenly attacks parts of the body it normally protects. In lupus, this leads to inflammation and damage to various tissues, including skin, joints, kidneys, heart, lungs, brain and blood vessels. When only the skin is affected, the condition is called discoid lupus (DLE) or subacute cutaneous lupus (SCLE). When internal organs as well as skin are affected, the condition is called systemic lupus erythematosus (SLE). The cause of lupus erythematosus is unknown. Viruses, ultraviolet light and some drugs may trigger the immune system to attack its own tissues. 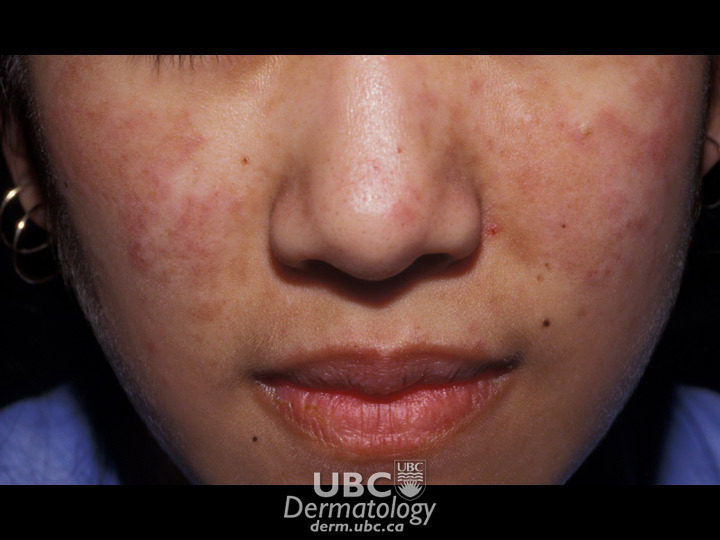 Female hormones may also influence the appearance of lupus erythematosis. Recently, research has led scientists to suspect that a mutation in a gene responsible for the disposal of dying cells may be involved in triggering the disease. There is currently no cure for lupus, but it is effectively treated with drugs, allowing people to live active and healthy lives. Rheumatoid arthritis (RA) is a chronic autoimmune disease that causes pain, swelling, stiffness and loss of function in the joints. The wrist and finger joints are commonly affected, but the knees and other body parts may also be involved. Frequent flare-ups may result in long-term joint damage, resulting in chronic pain, loss of function and disability. The skin may also be involved. Small nodules sometimes appear just under the skin, usually on a bony area near an affected joint. Dark areas, caused by blood seeping from damaged blood vessels, skin rashes and lesions—all due to vasculitis (inflammation of the small blood vessels)—are also seen in some people with RA. There is no cure for rheumatoid arthritis, but it can be controlled through a combination of drugs, exercise and joint protection techniques. 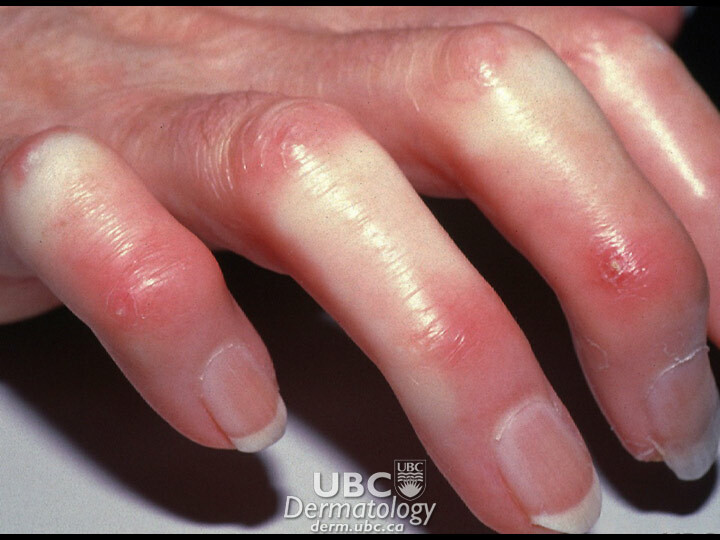 Scleroderma is a chronic autoimmune disease in which the skin hardens and thickens. There are two major classifications of scleroderma: localized, or morphea, which affects the skin only, and systemic, which affects the blood vessels and internal organs. Symptoms may be mild or severe. As the disease progresses, some people may be unable to carry out everyday tasks. Complications of systemic scleroderma may lead to serious problems with the body’s major organs, such as the lungs. People with systemic scleroderma should have lung function checked periodically. Scleroderma results from overproduction and accumulation of collagen, a fibrous protein that makes up the connective tissues in the body. Accumulation of collagen in the skin results in the thick, hard layers characteristic of scleroderma. In systemic scleroderma, this process also affects other organs of the body. The trigger for abnormal collagen production remains unclear, but researchers believe the immune system plays a key role. There is no cure for scleroderma, but treatment can relieve its symptoms. Dermatomyositis is a disease characterized by muscle weakness and a distinctive bluish-purple or reddish skin rash on various parts of the body. It may occur at any age but tends to affect adults between 40 and 60 years of age and children between 5 and 15. During periods of remission, symptoms spontaneously improve. The cause of dermatomyositis is unknown, however, researchers suspect that it is an autoimmune disorder. Genetics may also play a role. The person’s immune system is triggered to attack the blood vessels supplying oxygen to muscle and skin. The exact triggers have not been identified, but some researchers believe that exposure to certain drugs or viruses may play a role. Sometimes it can be associated with an internal cancer, so adults with this condition should be checked to rule this out. There is no cure for dermatomyositis, but the symptoms can be treated. Affects approximately 1 in 2000 people in Canada. Affects women 8 to 10 times more often than men. Most often occurs in women between 15 and 45 years of age. Affects approximately 1 in 100 people in Canada. Affects women 3 times more often than men. Most often occurs in adults between 25 and 50 years of age. Can also affect children and seniors. Affects approximately 1 in 1800 people in Canada. Affects women 5 times more often than men. Most often occurs in adults between 30 and 50 years of age. Along with polymyositis, affects 1 in 2000 people in Canada. Affects women twice as often as men. Most often occurs in children between the ages of 5 and 15 and in adults between the ages of 50 and 70.